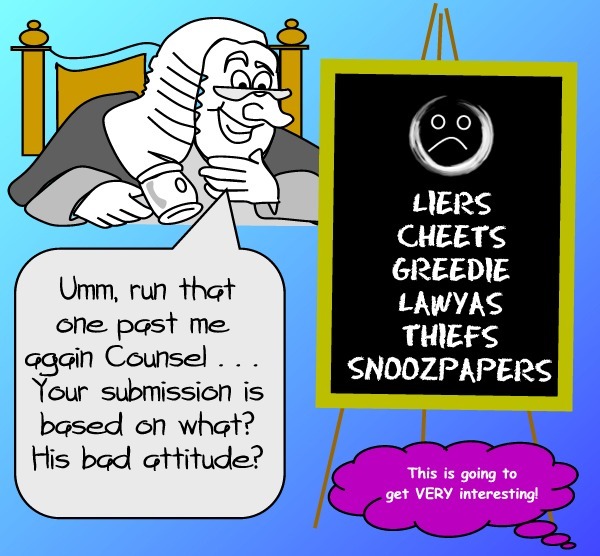 In this post I hand Samoan lawyer Rosella V. Papalii a lesson in legal logic, effectively ‘roasting’ her for the illogical grounds of her opposition to my motion to separate their $2m defamation case from my $3,500.00 civil case against Samoa Observer. Following my claim that there was no causal factor between the two cases, she responded stating that the “primary causal factor [is my] disgruntled attitude” towards her client. It is illogical that a [supposed] attitude can be a legal cause in defamation because as far as I know and understand the law, defamation relates to ACTUAL WORDS, ACTUALLY SPOKEN, about ACTUAL PEOPLE at an ACTUAL TIME and PLACE! Incredible, and as they say, only in Samoa! Samoa could be moving closer to thought crime legislation . . . according to the logic applied today by Samoa Lawyer, Rosella V. Papalii. I received today (as is per usual from this ‘uppy’ lawyer, slipped to me immediately prior to the court mention – of course without so much as a word) a NOTICE OF MOTION OPPOSING THE PLAINTIFF’S APPLICATION FOR SEPARATE HEARING OF THE COUNTERCLAIM. This basically means that she doesn’t want me to separate the two cases. Why it matters to her beats me because her claim can easily stand alone if it has any merit – but there you have it anyway! My guess is that she’s just got her ‘bits’ in a tangle because I a mere mortal, dared to challenge her, a lawyer and there’s a professional pride thing at stake for her. In short, I delivered but they didn’t and the owner and Editor in Chief Savea Sano Malifa basically told me that I was a smooth-talking opportunist* and to b*gger off. I grant him the first two points*, but unfortunately for crooks who try to hide behind power systems and deception, I tend to stick around a little! I tried to talk reason with the dude unsuccessfully; waited two and a half years and then sued them. After a bit of legal posturing Samoa Observer counter-sued for $2m claiming that an article I had written about Sano yonks ago was defamatory and caused Samoa Observer no end of grief, blah, blah, blah. My Notice of Motion claimed that there was NO LEGAL CAUSE between the two separate events, in other words the two matters were totally separate issues and should be separate legal cases. The Judge today set down a date in the new year to hear my Motion, 28 March 2016, 5 months away. Cool. Supreme Court of Samoa . . . here we come! This post analyses the issues of the Motion to separate the cases and gives my take on the whole thing including a damning wrap-up of Samoa Observer, it’s owner Savea Sano Malifa and their lawyer Rosella Viane Papalii by applying cold logic onto pure simple fact. o) AND THAT a Judicial Inquiry into these matters [Clauses f) to n) ] be commenced forthwith. DATED at Apia this _____________ day of October 2015. THIS MOTICE OF MOTION is filed by DENNIS ARTHUR SMITH, Plaintiff. e) SUCH further or others relief as the Court deems just in the circumstances. IT is in the interest of justice that the claim be heard together with the counterclaim. PARAGRAPH 1. is repeated and the Defendant further says that the allegations in (d) to (m) of the Plaintiff’s motion attacks the integrity of the judiciary and in particular Judge Roma who dealt with the civil list on the days in question. THE allegation of deception on the part of counsel is false, malicious and defamatory and misleads the Court. THE Plaintiff is well aware that Counsel in addressing the Court had apologised to the Court and Plaintiff for her failure to appear for the mention on 22/09/15 due to her involvement in the complex case of Savea Sano Malifa vs Registrar of Lands and Titles Court C set down for continuation of hearing on the same day before Justice Vaai. The matter was called at 10.00am and stood down until 2pm for both counsel to file supplementary submissions. Counsel’s whole attention was on the matter leading to the oversight / her forgetting to appear for the civil mention in eth [sic] District Court at 2pm. THE Court was also informed by Counsel on 29/09 that as the Plaintiff’s Claim is alleged to have commenced from 2012, the Plaintiff therefore required more time to search its archives for the information required for our instructions. THE Plaintiff’s malicious and false allegations against the Court and Counsel ought to be struck out as a frivolous, vexatious, without any proper merits and an overall, an abuse of process and should be committed for contempt of Court. Let’s get into the key bit first (there’s lots of juicy stuff in her Motion yet to discuss). The key paragraph is Clause 8 as Rosella herself explains. Unless she wants let me win the motion she of course has to respond to my claim that the Claim (my original court case for $3.5k) and her Counterclaim (for $2m defamation) are separate events. There is no dispute that the two entities are the same – Samoa Observer and me. It’s perfectly possible for two people to have separate cases heard before different courts. So that’s not the issue at stake here. I’ve also explained in my motion that the facts are separated. Rosella agrees, tacitly by stating the it is my “disgruntled attitude” towards Samoa Observer and Sano. It beggars belief that a lawyer acting for Samoa’s biggest newspaper who BTW is far from a stranger to defamation cases, both taking them and defending them for MANY years would product such an illogical justification for defending her action as a Counterclaim when challenged! 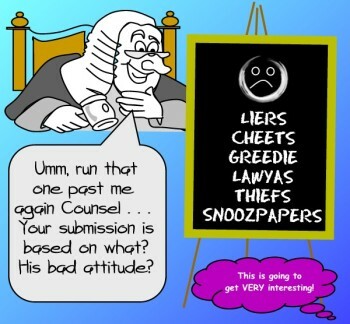 The logic that this ‘Supreme Court’ lawyer uses is that because [she claims] I have a bad attitude, her defamation case is a legitimate counterclaim to a simple civil case involving Samoa Observer failing to honour a commercial agreement. It’s too generous to even grant her that she’s scraping the bottom of the barrel! She’s clearly just out of her depth and is making an even bigger fool of herself than Sano did at the outset of the ‘scrap’. I asked a friend how much the fare was for a bus ride we were taking last week. and the answer was $2.00 each, well normally. The driver took my $5.00 for the two of us and didn’t give any change, despite being challenged by the both of us. It happens to Palagi here all the time if you really want to know. But that widespread racism means NOTHING until it is affected in an ACTION – THEN there is legal cause of action. Until that driver stole $1.00 his racism is of no significance legally. Morally of course that’s a different story because from the Christian world-view we are accountable to our Creator for our thoughts and motives as well as our actions. I have accused her of being up-herself, condescending, wanting to push her weight around and being unprofessional. NOBODY would like to lose to somebody who did that to you. I then accused her of deceiving the Judge when she apologised for forgetting to appear and then sought a further week “to get instructions from her client”. There’s two aspects to this, first it’s a serious accusation, and the second is that logically what I am saying will look to outsiders as something very likely true. More on that in a minute. Then I challenged her whole counterclaim and filed a motion to have the cases heard separately – oh the cheek! She might have been instructed to do this by her client. Lawyers present themselves as the bees-knees to their clients but in this case, her client has decades of legal experience on her and it is quite possible that Sano pushed her, or fed her, or at least contributed to the decision more than a regular businessman might with his lawyer. This is all very serious stuff for a Samoan lawyer, things that could potentially cause her extreme discomfort, if not losses even to the point of being charged with professional misconduct OR quite easily much more. For me personally, where the cases are heard is actually a minor matter. I’m not a lawyer so unlike Rosella, I don’t have a vested professional interest in winning any legal battle. It does though matter to Samoa, and the little people. If a puny little civil matter where you can represent yourself can blow-up into a $2m Supreme Court case requiring huge legal budgets just because some nasty person wants to push their weight around, then Samoa’s justice system will be seen as a waste of time by the little people and become a laughing stock in the legal profession. Rosella Viane Papalii has today introduced the concept of a thought crime into Samoan law. Should her defence of my application to separate the two cases succeed then Samoa will have its first THOUGHT CRIME CASE. Rosella may indeed get her wish for fame and fortune should legal commentators pick up the issues and take them further, but unfortunately for her it may get a little embarrassing for upping the anti like I have been doing comes from applying cold logic to facts. Heaven forbid that any others in the legal profession start this nonsense. Rosella has no clue why I submitted this motion. Now if a Supreme Court judge determines that there IS cause and that the two cases should be heard simultaneously, so be it – whatever. It matters nothing to me, personally. In regards to my motives, Rosella and her client will be among the first to know outside of my own team – I promise her that for while I am very comfortable with baiting and entrapment to reveal truth, I’m simply not interested in playing legal games and legal ambush. One thing I can assure her is that she will currently have absolutely NO CLUE – nothing – about the ideas, my motives, my reasons for my actions and the likely events of the future. In this regard I believe that Sano’s written revelation of the existence of the Samoan gossip-machine; his clear example of typical Samoan conduct towards problematic people like me; his bringing of a $2m defamation case and his lawyer’s conduct have all been a gift from God, something that I could never have engineered on my own even if I was a billionaire with all the time in the world. It all matters – a lot! I’ve found it interesting observing the way Samoa Observer’s lawyer has treated the whole thing, delaying tactics, obfuscation (or worse if you don’t buy her “Oh-sorry-I-forgot-oh-sorry-and-I-need-even-still-more-time-to-get-instructions” story), dishing up emotional twaddle for legal argument and guessing at my motives. The really funny thing to me is that because I have no agenda other than speaking the truth and have my entire case on it, I’m perfectly at peace discussing the entire legal process anytime she wants. All she’s gotta do is pick up the phone or flick me an email. “Dennis, what’s the reason for THIS?” or “What’s the essence of your THAT?” and “How can we best expedite this so that court time is minimised?” would be simple. Sure, it might not give her the same income at the end of the day, ’nuff said! A simple sit-down, pow-wow Judicial Conference sort of thing will be able to save days in court! My guess is that if Sano’s driving it, that will be put to the end of the options. I’d consider Samoa Observer to have deep pockets, certainly much more disposable ready cash than the average dude that would ever go up against them. Except for the shame-factor of getting roasted online and probably in due course in the court scene by a non-lawyer the only winner out of litigation must surely be the lawyer? This is the observation of my lifetime, and why I don’t hire lawyers, as a rule anyway. I’ve funded myself thus far, it’s cost me $WST20.00 for the original Claim in the District Court and $WST18.00 for the Motion to Separate the cases. That’s it. Sano’s legal bill thus far will be knocking the entire value of my original Claim very soon, if not already and there’s one thing I can predict, he’s unlikely to get a penny from me regardless of the outcome. and I then went on with the second set of requests. Rosella hasn’t separated them however assuming that they are all part of the one basis of the petition. They’re not – they are conditional. It may be a minor matter but I consider this sloppy work from a lawyer – lacking the care and quality of thought that should be due to a $2m defamation case. Surely when one party makes a claim, the other party should address that claim in the same manner as the claim is stated? Failing to include the conditionality in her objection could put an onus on the judge to address ALL aspects of her objection no matter what – some that could even have been moot. The carelessness of this oversight could come back to haunt her because the real juicy parts of her past unprofessional conduct, WOULD have been ignored by the judge if he’d awarded the separation of the two cases on the basis that they were separate cases with no cause. Now she has to reply on the judge to grant that they are moot points. Rosella Viane Papalii has replied to those issues I sought to be addressed should my request for proceedings to be split be denied. She didn’t address the process or even possibly something could genuinely stay the matters, just went defensive straight up. Cutting through the whole thing, the real one she’s concerned is the one I pinged, and it’s central to the whole matter, and that is her [alleged] deception of the District Court Judge. When I heard it in the courtroom in realtime I knew that something was not right. Rosella is right, I DID indeed tell the judge that this was not justice when he granted another extension of time to her. And indeed the judge DID say to me “You heard her, she explained that she forgot”. That’s not the point though, the point is that if she had forgotten then she COULD have been, and I posit SHOULD have been ready with her papers on the day she apologised. That would be normal, logical and perfectly believable. She had two weeks to prepare – she had no doubt informed her client of the mistake and would have been ready for the court hearing with her papers. But no! She appears to have forgotten for two weeks, then appeared with an excuse and ‘bought’ another week from a District Court judge who never it appears considered the possibility that she was feeding him a line, and in fact she simply didn’t have the documents ready because she wait for it . . . simply hadn’t gotten instructions from her client. Reading Clauses 10 & 11 of Rosella’s submission confirmed my suspicions entirely in regards to who I was dealing with. 10. THE Court was also informed by Counsel on 29/09 that as the Plaintiff’s Claim is alleged to have commenced from 2012, the Plaintiff therefore required more time to search its archives for the information required for our instructions. At no time did Rosella or indeed ANYONE mention this OR ANYTHING LIKE THIS at ANY hearing in the District Court. I know this because I had prepared a full 30 page Affidavit that included ALL the evidence that BOTH parties had or could have access to ready for a hearing – remember that I was ready for a full hearing ON THE FIRST DAY! The minute that she, or anyone would have dared to request more time on the basis of not having information I would have given an immediate response. Indeed not only is this a certainty in my mind, it DID actually occur. On the first hearing date, when we first met in court, Rosella sought a more detailed statement of claim. My response to the judge? “But she’s had my Affidavit for weeks and that includes it ALL!” Understand that this was the first time that I had appeared before a Samoan judge in a Samoan Court, yet what did I do? I explained that she had the information all the time! Rest assured that if anything like Clause 10 had ever occurred I would have been right up there and ready for it making my point very clearly. What this Clause 10 here is, is a cynical attempt to cover-up a misleading of the court with another more blatant one. Having been exposed with a minor misleading the court Rosella now resorts to outright fabrication in order to try to convince somebody, everybody, anybody that she didn’t mislead in the first instance. This is the slippery slide of deception that always leads in a downwards spiral. This is almost correct but the deception is obvious to those of us who were there and know what happened . . . Rosella asked for a further week extension “TO OBTAIN INSTRUCTIONS FROM HER CLIENT”. That’s it – period! The bolded sections of Clause 11, “FULL” and “AND FINALISE” are deceptive in that they imply that a work in progress was indicated to the District Court Judge when in fact this never occurred. This point is material, for the information before the District Court judge was incomplete, or assumed as a result of Rosella’s deception then her opportunity to file a Counterclaim and elevate the matter to the Supreme Court would of course have been denied. In 2012 Savea Sano Malifa entered into a simple commercial agreement with me, one that I honoured and he didn’t. Logically that makes me a man of integrity and him, not. In January 2013, Savea Sano Malifa, informed me that he had “been warned about me” and showed that he based his commercial decisions on gossip. Logically that means that because he trusted the Samoan coconut-vine gossip-machine over a man of integrity, unlike me, he makes decisions based on emotion – not fact and logic. Despite clear written warning and multiple attempts from me to resolve the matter in a true Samoan chiefly/godly manner which is to sit down and talk things through and avoid litigation, Savea Sano Malifa chose otherwise. Logically then I conduct myself in a manner more akin to the culture of the true Samoan Chief AND in accordance with Scripture than he does. That makes him a hypocrite – not me. Savea Sano Malifa failed to act on publication of the article that has caused him ‘no end of grief’ for more than two and a half years and then only in direct response to a commercial lawsuit from me over another earlier matter. Logically it is hard to see how any defamation suit can succeed in such circumstances thus Sano’s word has little credibility, if it had any previously. In court documents, Samoa Observer has lied outright in the key factors of their defence, proof already supplied online here. Logically this means that the defamation case is built upon deception and in the face of fact and logic, must fail. Opposing a request to separate two separate cases on the basis of attitude being legal cause is ‘novel’ to say the least. Logically then, if the judge finds in her favour, Rosella will have demonstrated a greater understanding of legal matters than me or if the judge rejects her argument then she has given her client poor legal advice and been beaten at her own game by a novice. I warned Rosella V. Papalii, lawyer for Samoa Observer in writing online and in papers served on her, that her defence contained provable lies, that she was exposing herself and her business badly. Logically then from the point that she became aware of provable factual error in the primary defence statement, any work that I do defending myself becomes costs awardable to me when the case inevitably fails, thus her client will be directly funding my blogging. In common language this is called “shooting yourself in the foot“. Proceeding with a defamation case with provable lies as the basis for it and with her signature on the Court documents is a high risk activity. Logically, unless there’s something that I’ve missed in all of this, she either has no fear (i.e. she’s stupid), she doesn’t understand the significance of her actions (i.e. she’s out of her depth), or she knows and understands it all very well but just wants the money. Samoa? Lawyer? That’s probably why the government introduced legislation to limit the capacity of lawyers to profit from the little people . . . ’nuff said. I reserve my right to take all the above matters further at any time in the future of course. Again anyone mentioned in this post have a full Right of Reply. * Sano’s observation is definitely correct on the face of it – I do have a way with words (it can be called the ‘gift of the gab’), and I am most definitely an opportunist in the sense that any businessman/entrepreneur is. Furthermore without ranting too much about it, I don’t think I’m too bad at both these things either. Sano’s problem though is that he’s not wrong in fact, it’s that he’s wrong in his deductions from that observation, that I manipulate, can’t be trusted or am deserving of whatever he wants to dish up at me – I CAN be trusted and I DO shoot straight, totally unlike the erroneous assumption he’s made. Cold logic says that if something is possible (it is) and if someone (like me) claims that to be the case, and someone else says something to the contrary (the Samoan coconut-press gossip-machine) then an exercise of due diligence is required to determine truth. Logic, due diligence, truth . . . Sano, Samoa Observer . . . nah, Supreme Court here we come! One objective of World War III is bringing political Islam into controlled conflict with political Zionism to exhaust and neuter both in the interest of NWO.